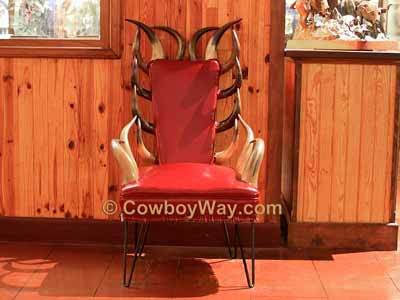 Horns chairs are a beautiful, timeless, piece of Western decor. They can be found for sale as new horn chairs, and also as vintage or classic chairs. Scroll down for good information to know before buying a horn chair. Is the horn chair new or used? Is there at least one good picture of the horn chair? If the horn chair is used, it is reasonable to assume it may have defects of some kind. The seller should clearly describe any looseness, wobbliness, scratches, scuffs, tears, stains, etc., and show the them in the pictures if possible. 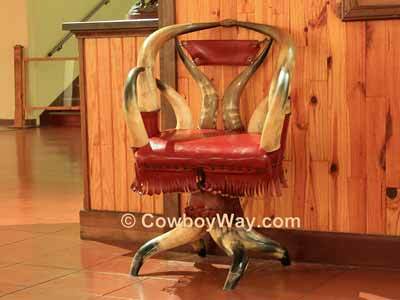 What types of horns are used in the chair? Are they real or faux? How big is the horn chair? Is it full-sized, child-sized, or a miniature? Does the seller give exact measurements in feet or inches? If the chair is full-sized and used, is it in good enough condition to sit in or is it for display only? Has the chair ever been reupholstered? Do you care? Will the seller ship the chair or do you have to pick it up? If the seller will ship the chair, what will the shipping charges be? It might be heavier or more costly to ship than you think. Be sure to check the seller's shipping charges to see if you think they're fair. If the chair is being shipped, how soon will the seller ship it after you pay for it? Where is the seller shipping from, and will they ship to your location? Is shipping insurance available? If it is, is it required by the seller or optional, and how much will it cost? What methods of payment does the seller accept? Does the seller offer any kind of a return policy? If the seller will allow a return, how long do you have to send the chair back, and is all of the purchase price refunded or just part? Check the "Seller info" area to view the seller's feedback rating. You can also read comments left by other buyers that have previously purchased items from that seller. If you have any questions be sure to ask the seller before you bid. Look for the "Ask a question" link in the "Questions and answers about this item" area to ask your questions.